Did you know that when St. Clair went North to face the Native Americans that over 200 hundred women and children accompanied the troops? These “camp followers”, as they were known, provided much needed assistance and companionship around camp. Many soldiers of this period were accompanied on campaign by their entire family. From cook, cleaner to nurse, the “Women of Camp” were what kept a soldier’s life complete. Join us here for Wayne’s Muster where the Fourth Sub-Legion’s Women of Camp demonstrate the day to day life of camp. 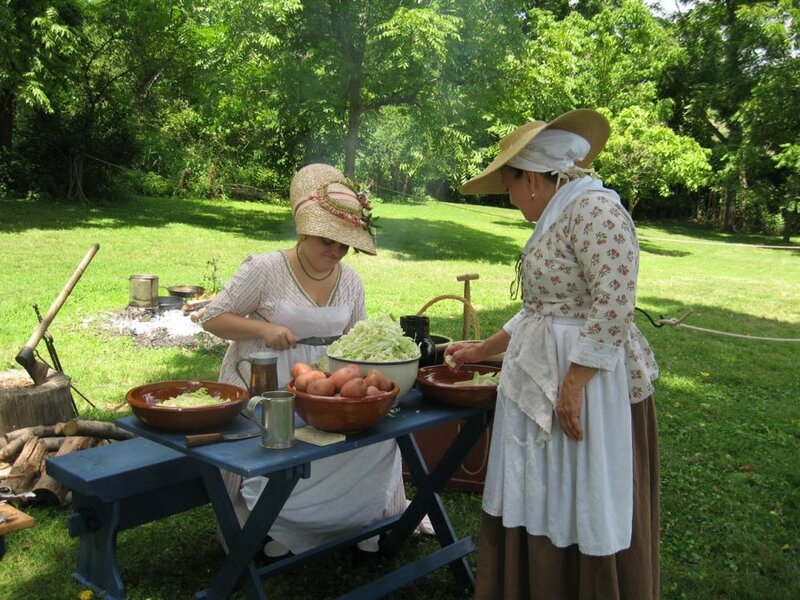 Come sample camp fare as the Ladies cook examples of camp food and discuss the life of a woman in camp. Join us at Heritage Village Museum June 29th 12-5 and June 30th 10-3 as we present Wayne’s Muster. General Anthony Wayne’s Fourth Sub-Legion will be here to demonstrate the life a soldier during the early years of Cincinnati. Visitors will experience camp life, military drilling, and cooking in our stone kitchen and fire pit by the Sub-Legion’s Women of Camp.